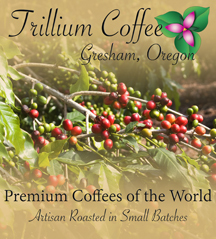 At Trillium Coffee Co., our passion is the meticulous roasting of carefully chosen premium Arabica coffees from around the world. We focus on varietal coffee beans with unique flavor qualities that offer maximum enjoyment. Our green bean buyer has superior cupping experience and develops close relationships with small responsible growers. All of our coffees are freshly roasted to carefully controlled roast profiles. We package in heat sealed valve bags to keep air out insuring maximum quality and freshness. We offer great pricing to the consumer as well as wholesale pricing to commercial accounts. Private labeled gourmet coffees are also terrific for fund-raising events for churches, schools, non-profits and other groups, including promoting your small business. Profits are excellent and your name or cause is in front of the consumer for many days when they buy and enjoy the great coffee. See the "About Us" page for more information. We are currently building this site, we appreciate your patience. For more information, for pricing, or to inquire about placing an order, please email info@trilliumcoffee.com or you can send us a request or message through our "Contact Us" page. Our shopping cart is now active, but we can also respond to emails quickly and would be happy to work up an order for you over the phone.